Metallic Orb Sent By Aliens, Suggests Scientist? Scientists have found a tiny metal orb they believe is extraterrestrial in origin, has evidence of life on its exterior, and also has “a gooey biological material oozing” out of it. The lead scientist of the team who discovered the object suggests that it may have been sent by an intelligent extraterrestrial civilization for the purpose of seeding life on Earth. This revelation comes from the Buckingham Centre for Astrobiology at the University of Buckingham and the University of Sheffield in England. The director of the center, Professor Chandra Wickramasinghe, is one of the leading proponents of a theory called panspermia. Panspermia is the idea that life in space is abundant, and that biological material travels from planet to planet. For example, it may be ejected from a planet via a meteor strike, or volcanic explosion, and then many years later falls onto a barren planet seeding life. 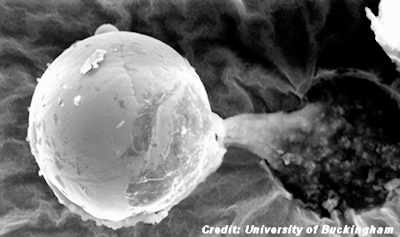 An even more controversial version of this theory is called “directed panspermia,” which is the purposeful seeding of life on other planets by an intelligent extraterrestrial civilization. The findings by the Buckingham Centre for Astrobiology in this area have been highly controversial. They claim to have several examples of microbial life from extraterrestrial sources. Their latest claim is regarding samples they received from a balloon they launched into the stratosphere. They gathered samples of material floating around up there. It is believed that the stratosphere is too high for microbes from Earth to reach, so any they find must be extraterrestrial. . . .
". . . Life On Earth Was Created By Scientists Belonging To a Superior, Alien Civilization . . ."
Great catch and article by Alejandro and of course my favorite UFO website! Panspermia: the acknowledgment that life cannot start on its own, and the ridiculous assumption that it must have come from space, ignoring the first idea that if it cannot start here, then it cannot start anywhere else without creator. Why do "aliens" flee at the name of Christ?